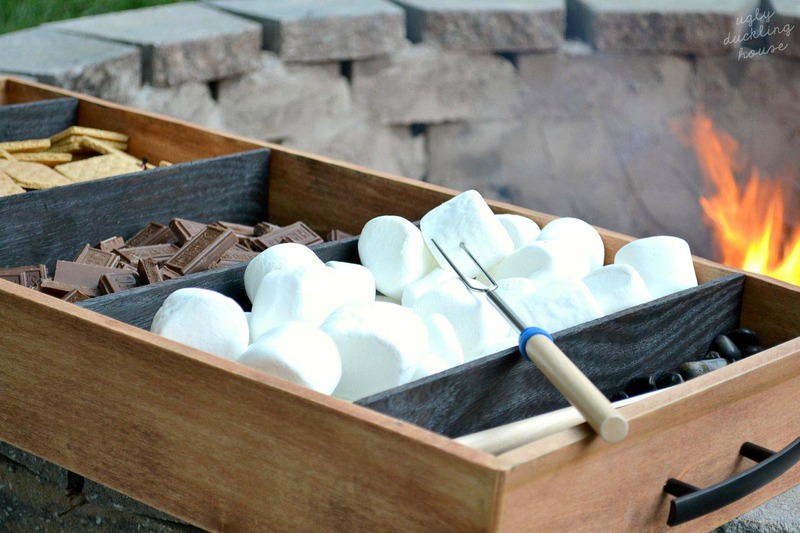 It’s time to kick off summer with this DIY charred wood s’mores tray — perfect for outdoor entertaining! 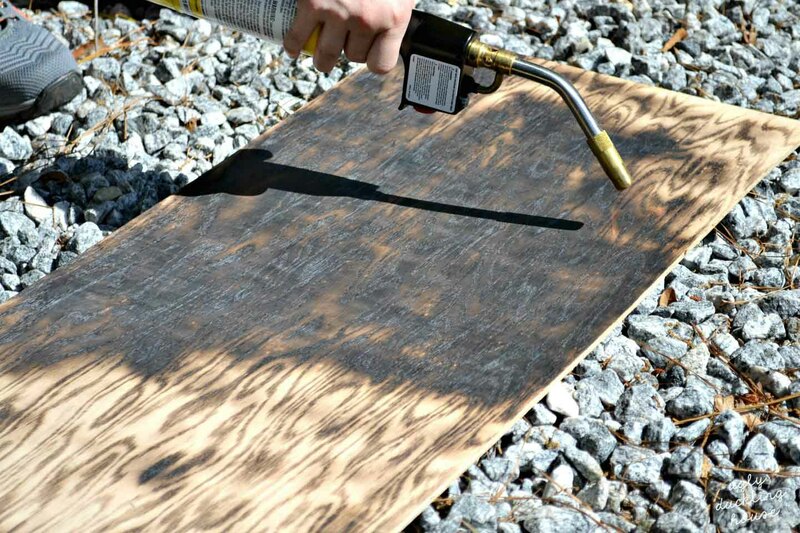 In this tutorial, I also talk about one of the latest woodworking trends taking over Instagram: shou sugi ban. 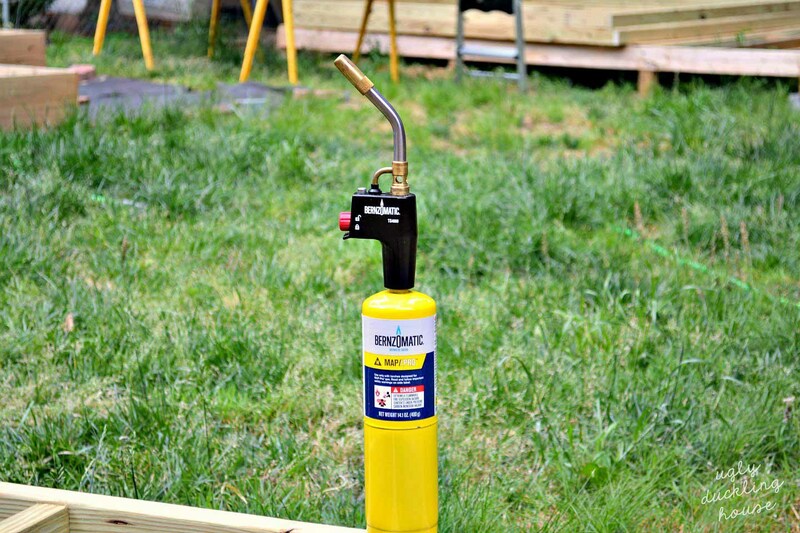 If you’re looking for more fun woodworking ideas after this tutorial, be sure to check out this backyard drink station or this roundup of easy woodworking ideas. I hope those of you in the U.S. had a nice extended weekend! As for myself, I got a little more done on the new wood deck and put the first pieces down. 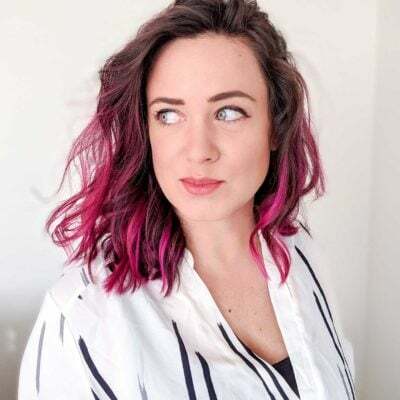 There’s still a little more work to do before I can reveal that to you, so today, I’m celebrating the official start of summer with a new DIY. 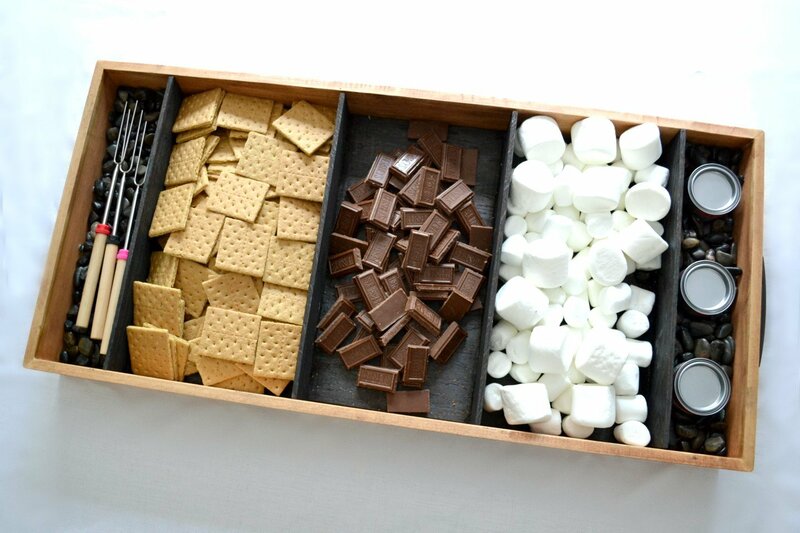 This new s’mores serving tray will be perfect when we have friends over for our bonfire hangouts! 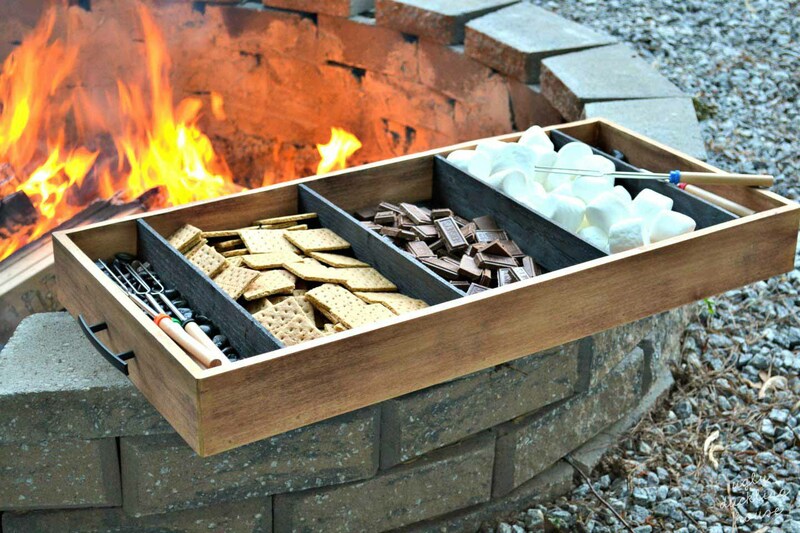 What’s unique about this tray is the interior… it’s all charred wood! My inspiration for the idea first came from learning about shou sugi ban on Instagram. 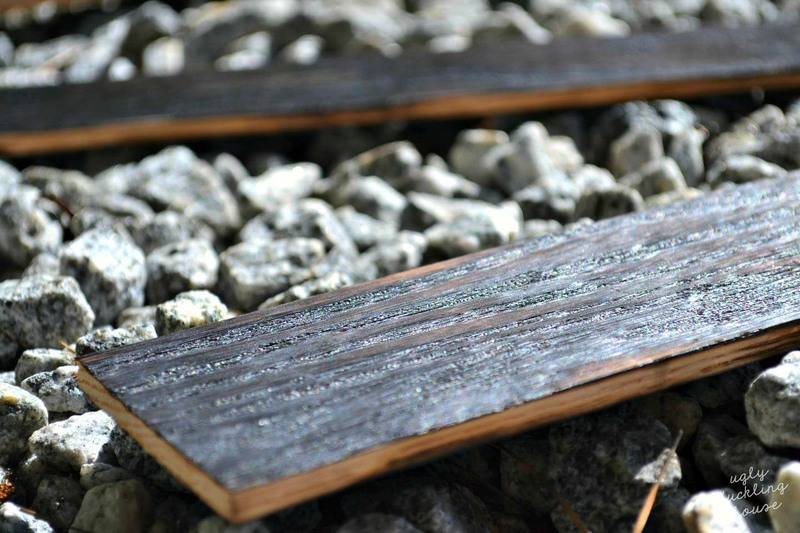 For those that don’t know, shou sugi ban, or yakisugi, is a traditional Japanese method for wood preservation. 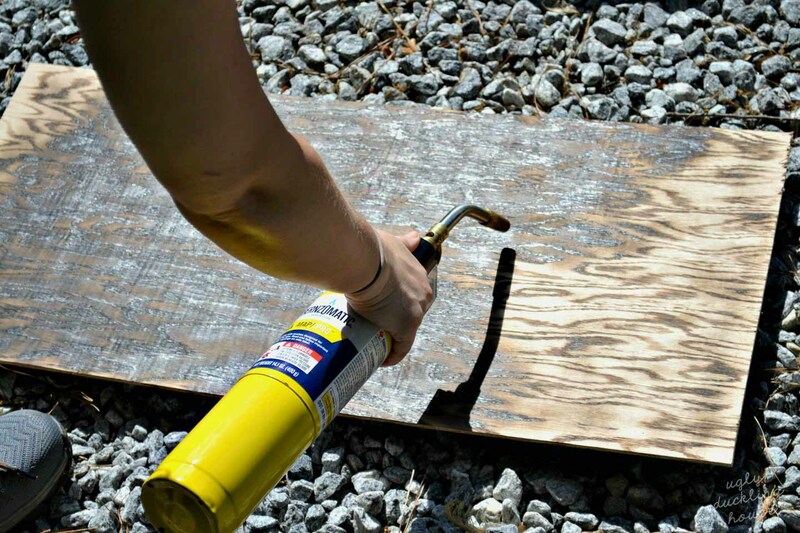 It’s most commonly done on cedar, and meant as a weatherproofing technique. I highly recommend giving it a cursory search, but be warned: it’s a rabbit hole that you will get sucked into! Some of these projects, like my pal Jonny Builds on Youtube, are so cool to watch. Sponsored project in collab with Bernzomatic. Confession: I hate measuring. So whenever I can, I avoid it and prefer to cut things to size using the elements of my project as reference to make marks instead. While I will provide a few measurements for the sake of accuracy for my tray, feel free to make this tray with custom dimensions! 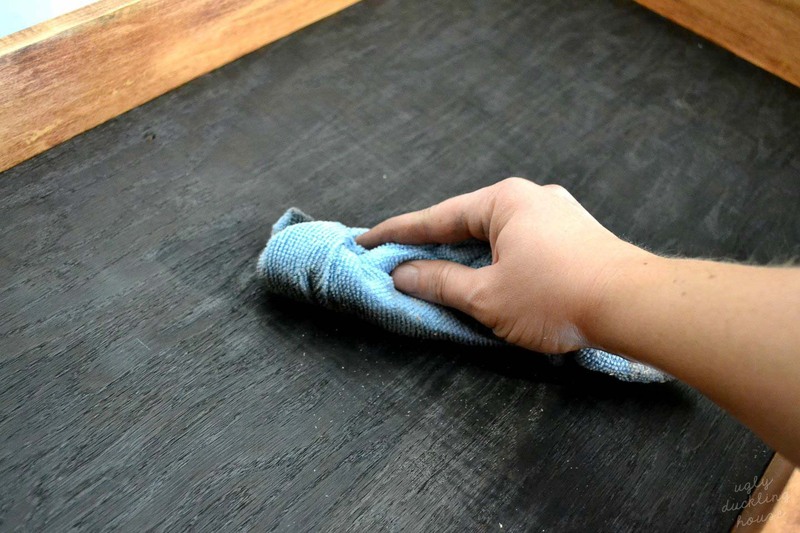 Start with a 1” x 8” x 8ft (actual dimensions ¾” x 7 ½” x 8ft) board in a species of your choosing (if you want a narrower tray, use a narrower board of the same length or cut a custom size of plywood). I went with poplar because it’s an easily-accessible hardwood in my area, and I thought it would be great contrast with the black interior. Cut it to two pieces, roughly 36 inches in length each. Don’t worry if they don’t match up perfectly; you will cut them to square as you’re assembling the tray. With your two cut pieces ready, glue them together, side by side. These will serve as the bottom of your tray. I’ve found that even with two really straight pieces, it’s good to use clamps to keep the boards together until the glue dries (about 24 hours). Once cured, cut off both ends so your board is a perfect rectangle. I drew up a quick diagram to help visualize everything that’s going on in this step! 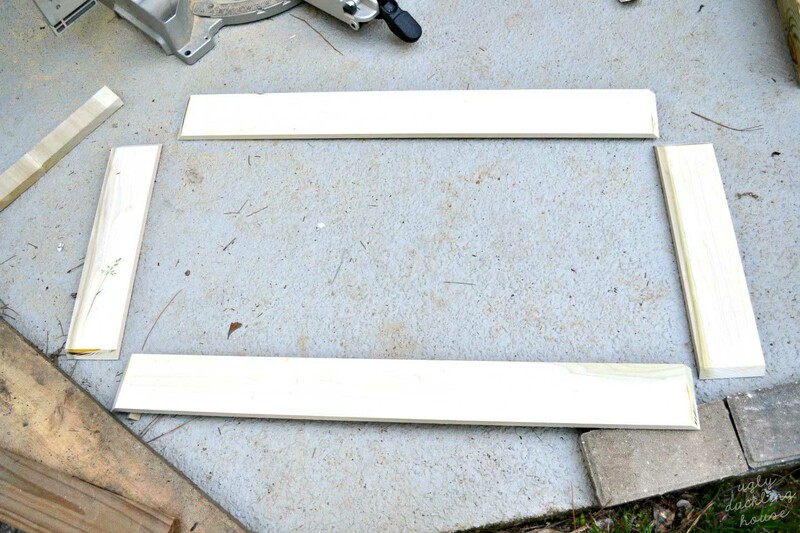 Next, cut all four sides of the tray using the 3 pieces of ½” x 4” x 4ft poplar (one each for the front and back; one more to cut the two narrow sides). 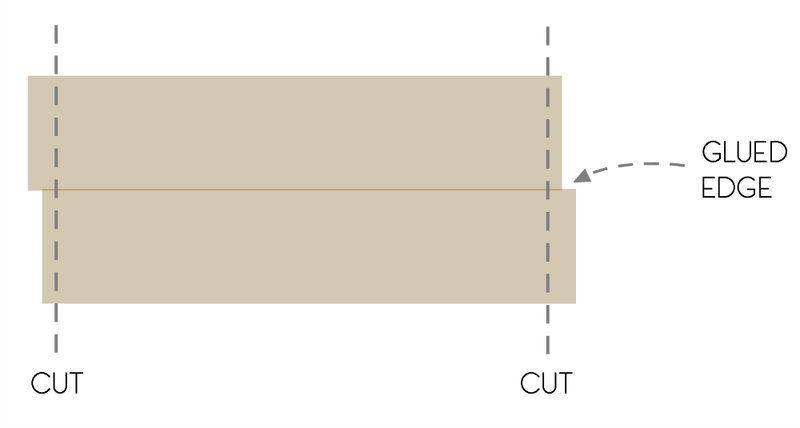 Use a miter saw at a 45-degree bevel (tilt the back of the miter saw to “bevel” it to 45 degrees). To get the measurements right, I used the already-cut bottom of the tray and marked the ½” poplar where the tray ended. You can also use a tape measure to get the exact measurement and cut, but I find that I get less mistakes this way with my miters. 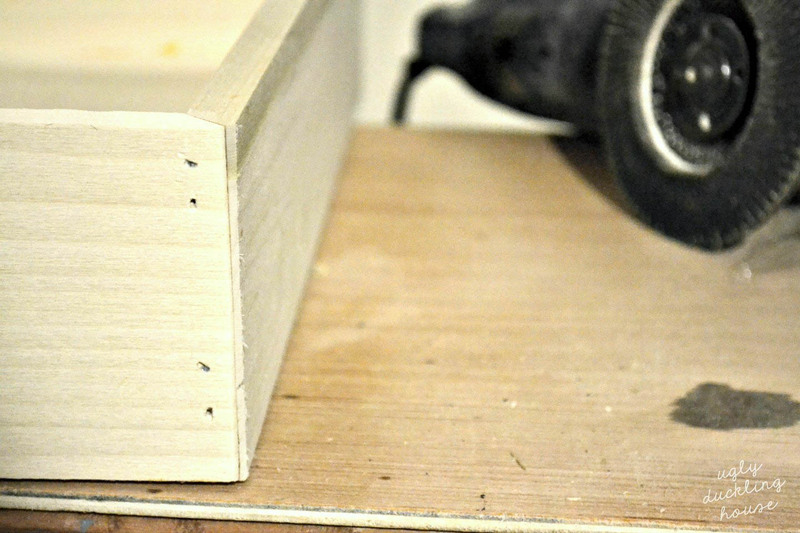 Add wood putty to fill holes, then sand smooth. Stain a color of your choosing. With the main part of the tray complete, the burning can begin! I tried out my Bernzomatic TS4000 on a piece of scrap poplar to get the hang of the burning process. I quickly learned that it needs to burn evenly on both sides in order to prevent the wood from curling. I torched everything outside, right on top of the gravel area that surrounds my fire pit. 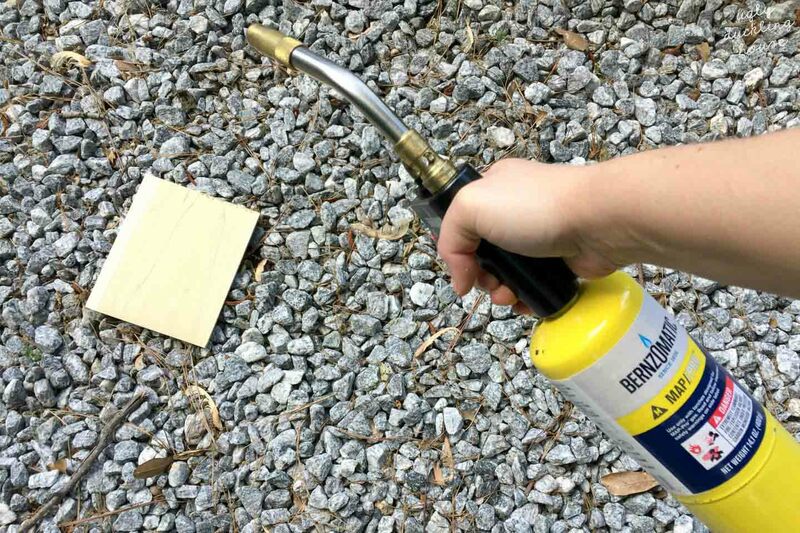 If you don’t have a gravel area, try bricks or cinder block in a well-ventilated area. 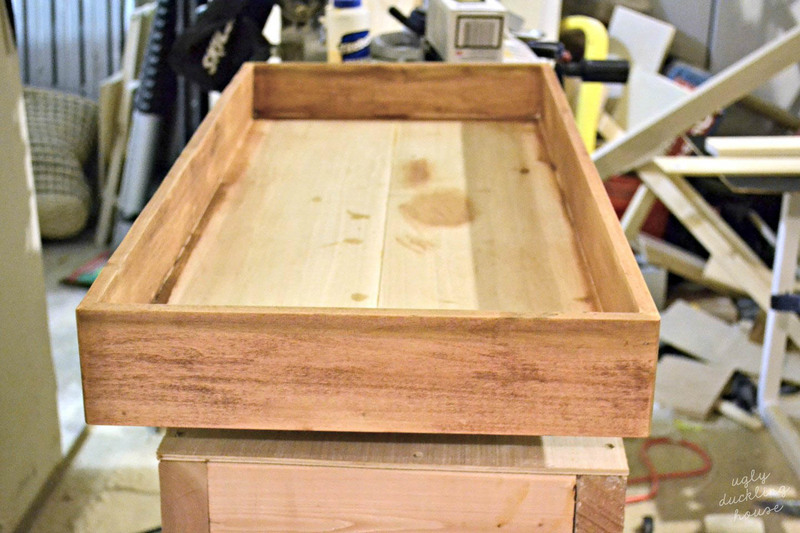 Cut a piece of ¼” oak plywood to fit the inside of your tray. I liked the look of oak grain for this. I don’t recommend using glued-together boards… I tried it, and it fell apart at the glue seams! Let’s try this again… much better! The key is to be steady and apply the same amount of heat in a section, and flip to keep the board from curling too much. After allowing some time for the plywood to cool, glue and nail the liner in place in the bottom of the tray. 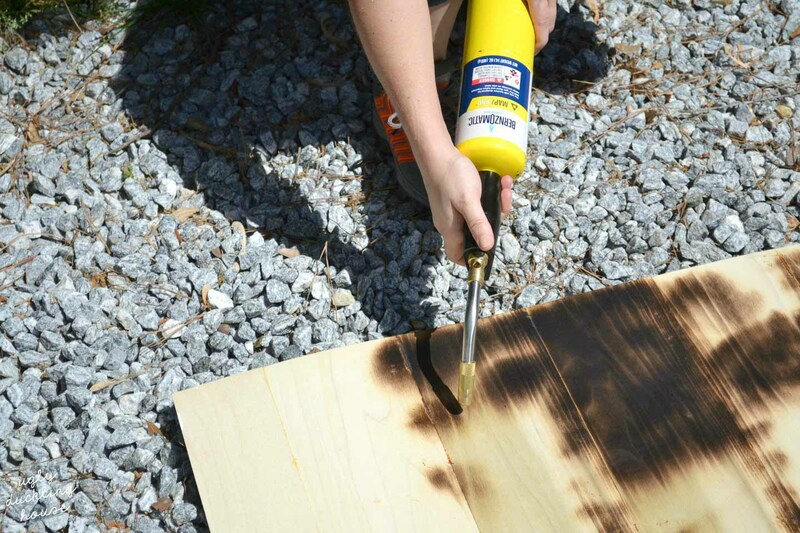 Wipe down the charred wood to remove as much residue as possible. 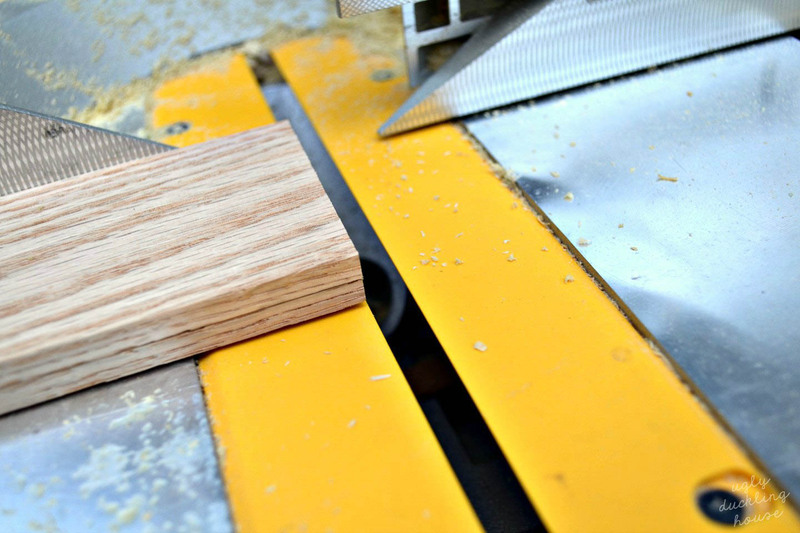 Next, cut pieces of ¼” x 3” oak board to serve as your dividers (I chose to cut 4 to create 5 compartments total). Again, I find that marking the board against the tray itself makes for a more accurate measurement, but you can also measure and cut to length (in this case, 14 ½” long). 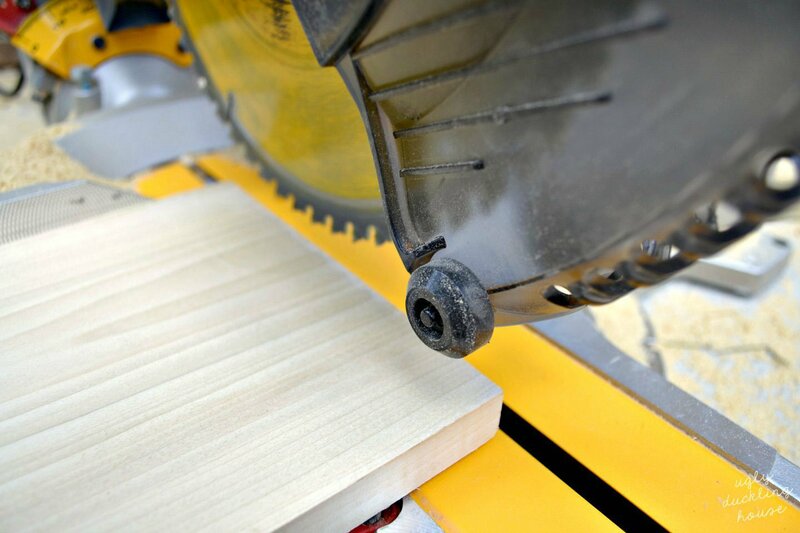 Stacking them together helps to keep the saw from splintering the thin pieces of wood. 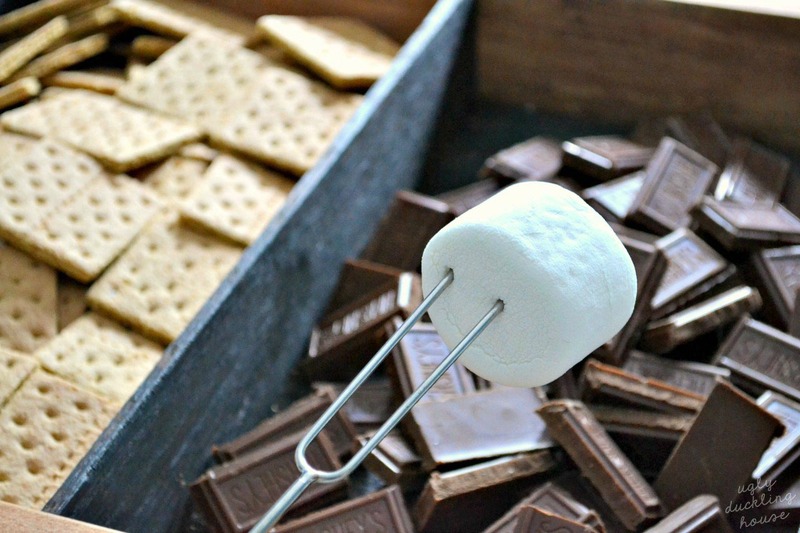 Do the same charring process with the dividers as you did with the bottom liner. Once cooled, glue in place where you want to divide each tray compartment. To make the tray food safe, a food-safe finish (such as salad bowl finish) should be applied to the entire interior of the tray where food might touch. While this would be considered “light” food use (compared to a plate, cup, or cutting board, etc.) it is still recommended to wait until the finish is fully cured and hardened before coming into contact with food (in my case, that would be 30 days). Add handles to make it easier to carry around, and enjoy! 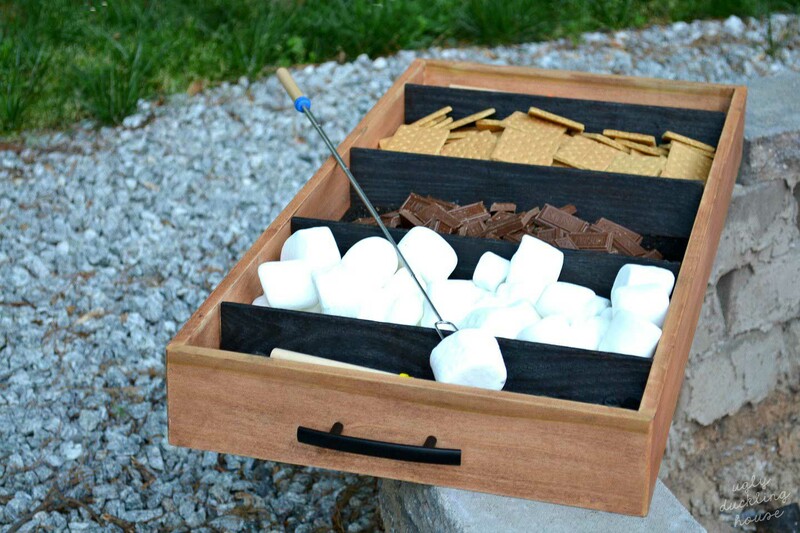 When outside, the 3 middle compartments of the tray will mostly be used for s’mores. 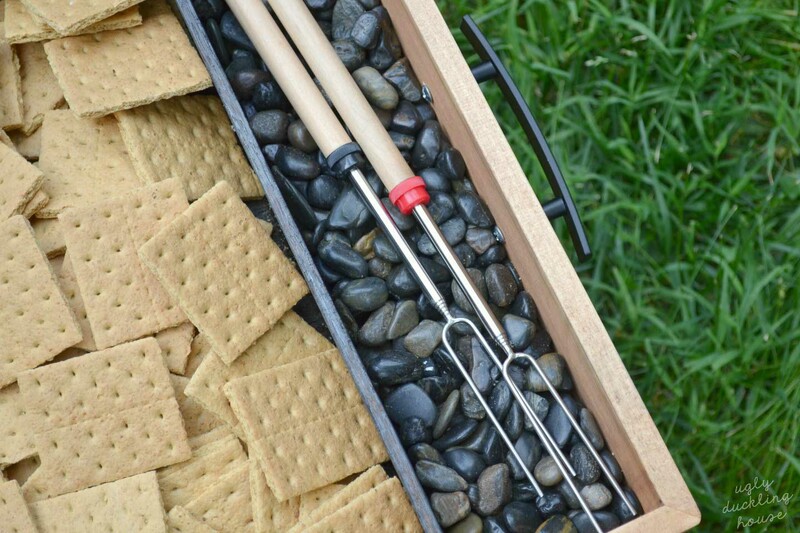 The two narrower ends are filled with decorative rocks to hold my extendable roasting sticks. 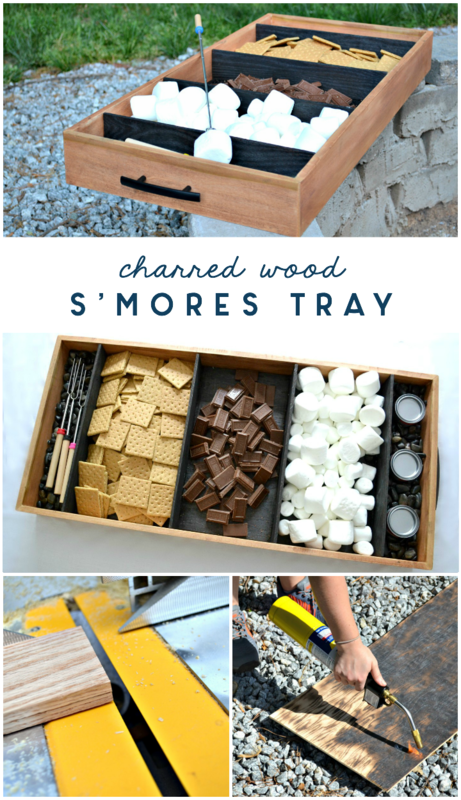 When inside, I can use one of the compartments on the end to hold small canned heat containers and still enjoy the delicious s’mores-y goodness. I couldn’t help myself and checked out the tray next to my fire pit as I was burning up some scrap wood (staging only, of course; this tray wouldn’t be fireproof enough to sit on the lip of a firepit for actual serving purposes). 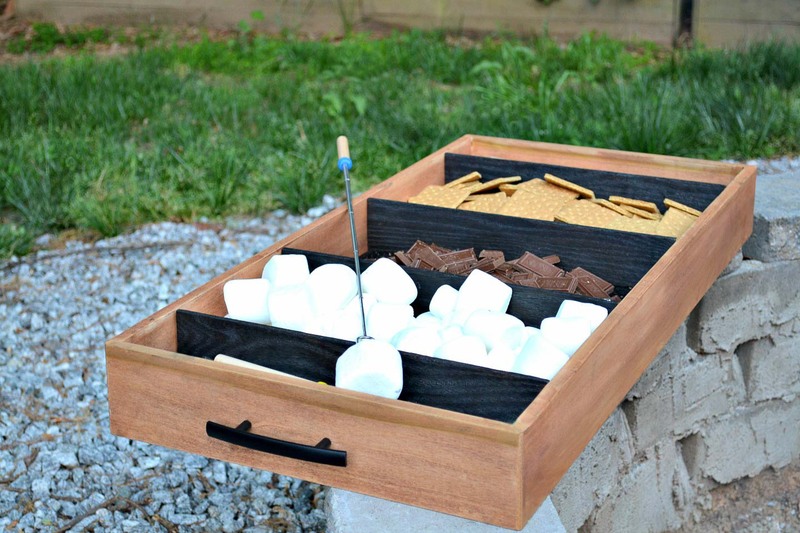 Since I’m looking forward to using this tray after Memorial Day when a few more outdoor entertaining spaces are complete, I think this will make a wonderful new addition at my next summer party! 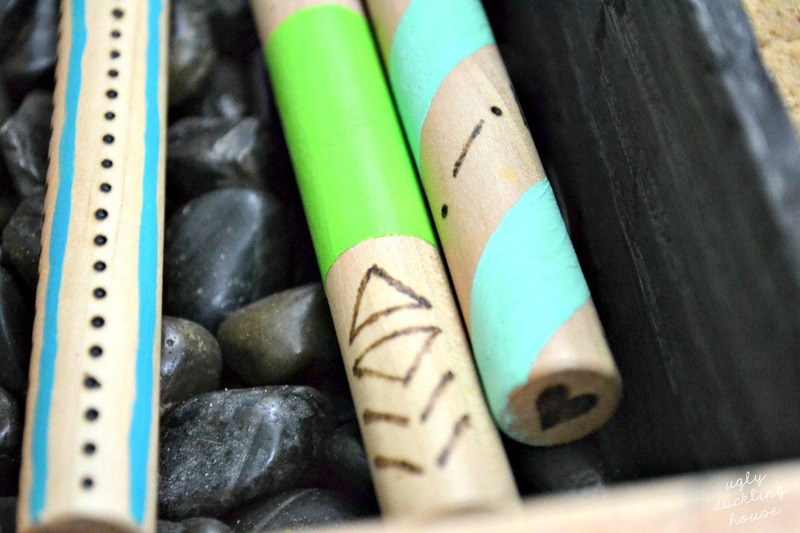 I’ve got a complementary post coming up about these roasting sticks, too: a great little word-burn design project that is bright and colorful. Stay tuned for that one in just a little while; should be up later today! I think this will make a great addition to the party vibe in the back yard once the new deck is in, don’t you?